Today I’m thrilled to have Misty Henry on the show. Misty is someone who I randomly ran across as I was doing research on how to sell children’s goods. And up until this point, I’ve been absolutely terrified of selling goods for kids because of all of the testing requirements. As it turns out, Misty is an expert in this area and she runs a small cloth diaper supply shop called Little Gnome Creations. She’s also a board member at the Real Diaper Industry Association where she serves as their lead safety compliance expert. Finally, she owns the Work At Home Mom Alliance where compliant artisans of any industry can join. What is compliance and why it’s necessary. What types of children’s products are required to be compliant. The testing requirements for children’s goods. Famebit.com – If you are interested in getting popular YouTube stars to endorse and promote your products, then click here and use coupon code mywifequit to get $10 off your first campaign. HostGator.com – If you are interested in starting your own WordPress blog, then click here to get 30% off webhosting at HostGator.com! MyWifeQuitHerJob’s transcripts are done by Outsource2Africa.com, an awesome transcription service that is half the price of other competing companies. Highly recommended! Steve: You are listening to the My Wife Quit her Job Podcast. And if you are new here, it’s a show where I bring in successful bootstrapped business owners to teach us what strategies are working and what strategies are not. Now I don’t bring on these famous entrepreneurs simply to celebrate their success, instead I have them take us back to the very beginning, and delve deeply into the exact strategies they used early on to gain traction for their businesses. Now if you enjoy this podcast please leave me a review on iTunes, and if you want to learn how to start your own online business, be sure to sign up for my free six-day mini course, where I show you how my wife and I managed to make over 100k in profit in our first year of business. Go to www.mywifequiteherjob.com, sign up right on the front page, and I’ll send you the free mini course right away via email. Now before we begin I want to give a quick shout out to my sponsor Bigcommerce. Now Bigcommerce is a fully hosted shopping cart platform that allows you to set up your own online store in minutes. And as most of you probably know, I teach a class on how to start a profitable online store, and Bigcommerce is actually one of the shopping carts that I highly recommend in my class. Now here’s what I like about Bigcommerce. Unlike other competing platforms, Bigcommerce does not nickel and dime you with every little shopping cart feature. And when you sign up, you’ll immediately have a fully featured and extremely powerful shopping cart at your disposal. There’s also an incredible theme store where you can choose from a variety of attractive store designs, so you don’t really need to hire a designer. And everything from design to payment processing is all built-in, and all you got to do is populate it with your own products. So you can literally start your own online store in a matter of hours. Simply go to bigcommerce.com/mywifequitherjob, sign up and you will instantly receive one month free. Once again the URL is bigcommerce.com/mywifequitherjob. I also want to thank HostGator for sponsoring the show. HostGator is an incredible webhost that I highly recommend. And in fact did you know that mywifequitherjob.com was hosted on HostGator in the very beginning? They offer 24/7 live support, via chat, phone, and email, one click WordPress installs, an easy to use website builder, design services, marketing services and the best part is that I’m offering a 30% discount for all podcast listeners. So please go to HostGator.com/mywifequit to redeem the discount. Once again that’s HostGator.com/mywifequit. Now onto the show. Welcome to the My Wife Quit Her Job Podcast. We will teach you how to create a business that suits your lifestyle, so you can spend more time with your family and focus on doing the things that you love. Here is your host Steve Chou. Steve: Welcome to the My Wife Quit Her Job Podcast. Today I’m thrilled to have Misty Henry on the show. Now Misty is someone who I randomly ran across as I was doing research on how to sell children’s goods. Now up until this point I have been absolutely terrified of selling goods for kids, because of all the testing requirements. You got to worry about lead, whether your fabric meets fire safety guidelines, there’s actually a long list of guidelines which can be very intimating if you are just starting out. And as it turns out Misty is an expert in this area, and she runs a small cloth diaper supply shop called Little Gnome Creations. She is also a board member at the Real Diaper Industry Association where she serves as their lead safety compliance expert. And she is also the owner of the Work at Home Mom Alliance, where compliant artisans of any industry can join. And of course I forgot, she also runs a Facebook group called CD compliance which is actually where I ran into her. And with that welcome to the show Misty, how are you doing today? Misty: Thank you, I’m doing very well. Steve: So Misty give us a quick background story and kind of how you started your cloth diaper store, and how you started getting all this information about being compliant. Misty: Wow, okay, so — well, this is like quite funny because a lot of people feel like I know everything about everything to do with safety compliance in diapers, and that is not true. Steve: Oh Misty, did I get the wrong person here? Misty: So I started out my son — no right, no I started out, my son was born in 2010, my oldest. And I had ran across this cloth diapers, what is cloth diapers? Obviously maybe my grandparents might have used those things, but I had no clue, it just didn’t even face me. So I started looking into it, and I thought wow this is really cool, this will save me some money, and really have has the side benefit of it’s great for the environment, so that’s a huge bonus. And then I got to — well, I can’t afford them yet. So one of my friends as a surprise baby gift bought me my first cloth diaper set, and from there it just blew up. So we have my friend to thank for either the starting right, no pun intended. So I go, okay, there’s got to be a way that I can make these, I just got my mom’s sewing machine, and I got excited to saw. And I thought okay, I saw — I made a curtain, why not make a diaper, they are the same thing really, straight lines with curved lines. So I made this big and went, oh I could sell this. One of my friends actually saw it and she goes I need a bunch, we are having some hard times and I said, you pay me for the supplies and I’ll just send them to you, because it’s giving me practice, and I enjoy it, and it’s something I can do to help you out. And she said no-no-no, I need to pay you. I said, no just the supplies and shipping will be fine, she said, okay, so I started that. And then from there I made her some more, and then I made another friend who just had a baby. I made her a complete kit, and she absolutely love them she said, these are perfect, amazing, better than some of my name brand diapers, and I went awesome, this is great. So then I started this pre-order style business, where I would allow people to pre-order supplies, and I would order in bulk, and then everything that they did not order would just go in my shop. And that way I was getting a deal on the supplies I needed as well as they were. And then I also recoup some of the cost of my time with my actual store Little Gnome Creations. So everyone started asking for tags, I went okay, well, I would like to do a nice template that surely there’s a template online somewhere. So here I go to Google, looking up cloth diaper – no-no-no, clothing care tag yes, clothing care tag enter. And oh, my goodness, the can of worms I opened, I found that there were actually regulations that are requirements for how a clothing care tag is supposed to look. I said, oh, wow, okay, this is a lot more than I bargained for, but I am curious. I am that curious cat that needs to have those nine lives, because I have used seven of them. I jumped in head first researching and researching, and I found from the FTC, the Federal Trade Commission, I found the clothing regulations, and then from there I found children’s regulations with the consumer safety. Consumer product safety commission, and wow I mean it has been — it’s been four years now. I have been working on safety compliance for four years, and it’s amazing that I have over 10,000 members in that compliance group alone. CD compliance and not some people coming and going, so I mean I have helped — I have had the amazing pleasure to be able to help guide people, and not just becoming aware that these regulations even exist, because we all started there, we did not even have the imagination to think, oh maybe there’s regulations I’m supposed to follow. We’ve all had our sales talks, but how often do we hear safety compliance? We know that someone regulates products for big companies, but we don’t think about it for handmade. And that’s where I stepped in and we went, okay guys can you believe this information that I found, I’m going to do more research, and we are going to go through it together. And from there I just started putting it in easy to read documents and just compiling all the information that is literally in four, five, six different areas. I put them all in one space for everyone to find as easy as possible. Steve: Yeah, so Misty first of all what is compliance and what types of good needs to comply? Misty: So compliance, the word compliance is simply obeying any set rules. So what I specifically have focused on is labeling compliance with the FTC, and safety compliance with the Consumer Product Safety Commission. There is also business compliance for taxes, there is compliance for following speed limits, you are complying to a rule. Steve: Okay, so maybe let’s focus on just like the consumer compliance and then the labeling requirements. Misty: Right, so the Consumer Product Safety Commission, okay this is amazing how much they actually cover. This team of about 500 employees covers every single item you can imagine in some format. So we’re going to narrow it down even further, because they regulate electronics, beds, our TVs, clothing. If you can think it they regulate it in some ways, so we’re going to break this down even further and focus it to children’s clothing. So children’s clothing then we’ve narrowed it down, we follow … do the components, the fabrics and the snaps and the zippers, do they have lead? Are they flammable? Are they going to and when we talk of flammability there’s two forms, there’s is it going to light up next to an ignition source, and then continue burning, or will it stop burning if you move away from the source, and then there’s the sleep wear which is mostly what people think of that it’s only for sleep wear. Steve: Okay, it’s funny I have several friends who work in large companies and they literally pay hundreds if not thousands of dollars per product just to be CPASIA certified, which is I guess is the consumer products certification. Misty: Safety, it’s the Consumer Product Safety Information Act, or excuses me, Improvement Act. Steve: Improvement Act, yeah and so I mean these large companies have these budgets to do the testing, but how can a small business owner who can’t afford to do that testing sell goods for children? Misty: So this is actually really awesome, the handmade [inaudible 0:12:20] compliance, when all of these regulations first came into effect in 2008, they said wow-wow-wow, wait a minute, we cannot, there’s absolutely no possible way that we can take on that financial burden of testing, and these testing costs. So they went to the commission and said, please we have to rethink this, there is got to be something we can do to lessen that financial burden. So the CPSC went back to the drawing board and said okay, let’s discuss this further, and out of that we have the small batch manufacture benefit, where a small batch manufacturer one who produces less than 7500 units per year, and makes less than one million dollars gross per year is allowed to have this ability to use their supplier statements, or certifications that a component has already been tested. If they say yes and even better if they can supply me with an actual certificate saying that it has been tested and passes, I can keep that in my records as longs as I’m registered with CPSC, so we’re just free by the way, I keep their statement in my records, and I’m good to go. As long as I trust that supplier, if I don’t trust that supplier I might need to go to find someone else. Steve: And if they don’t have this documentation, can you just assume that it’s not certified? Misty: If they can’t offer statement, or if they can’t offer you the certification is I would say the Safety standard is not certified, and you will need to get your own testing done. So I highly recommend searching around your supplier, contacting them first, saying “I’m interested in this product, do you have this tested?” And if not then seek someone else. Steve: Okay, I’m just curious Misty, do you get any of your raw materials from Asia, or is it primarily the US? Misty: To be honest a lot of my stuff comes from basic Hobby Stores, because there are exceptions that the CPSC allows, so for example the lead and textiles regulation, there is a huge list of fibers that are actually exempted, cotton being one of them. So the most popular is going to be cotton, polyester, spandex and brayon and nylon, all of those are exempted fabrics, they already know that by processing them, there is no actual lead that will harm anyone in the processes to make them. Those are already exempted from having additional testing, I can ignore those pretty much. So my snaps then, if I’m making dippers or something that has a snap or zipper, I generally get my snaps from a company that distributes them and they are actually made in China. So the snaps are made from China, but they are sold from here in the US, and the lady that owns that business is absolutely amazing, she is wonderful to work with and she is extremely easy to get statements from, and she does her own testing for her snaps and then the zippers. The — surprisingly the popular brands are already tested, so like YKK zippers and the Coats & Clark zippers that you can get at Hobby Stores, they are already tested, all you have do is contact the manufacturer and they’ll say, “Yap we’ve got it tested, here’s our statement.” And you are good to go. Steve: Okay, I was just curious do you have any experience working with some of the Chinese manufacturers directly, and is it — if you get something from Asia for example, is it your responsibility to get it tested…? Steve: Or do the Chinese venders typically have the certification? Misty: There’s two ways to go about this. If you are importing a component, you can use the supplier statement that the product has been tested, and it’s hit and miss. I think if you have a really good factory that you’ve been working with, you can find one that they either have already done the testing, or they are willing to take that extra step to do the testing for you, and I think if you can get a good working relationship with a manufacturer ,do it. I mean it’s definitely worth the extra relationship communications. For finished products though, like let’s say I wanted to import already made dipper, already made shirt, I’m responsible for making sure that it complies, and I have to do my own testing, or have testing done before it comes to the US and before I sell it to my consumer. Steve: Okay, actually before we go on, what constitutes a children’s good exactly, like what’s the definition? 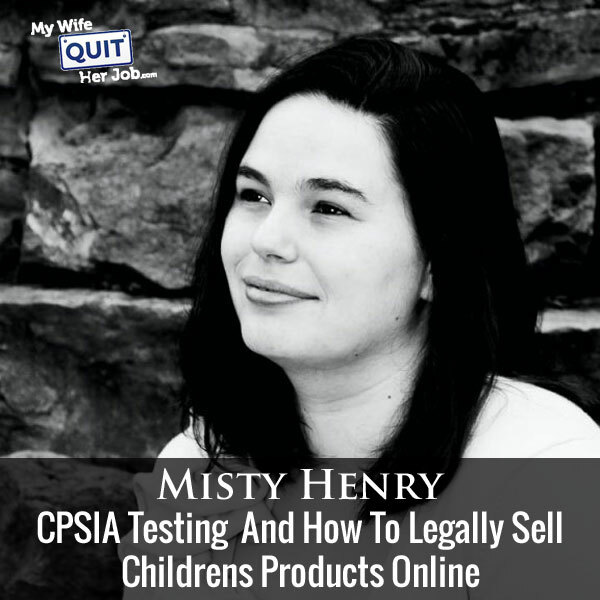 Misty: Under the CPSC, the Consumer Product Safety Commission, anything that is geared towards or will be used by a consumer that is 12 years old or under, is going to be a child, so any clothing that is geared for 12 years old and under will be under that children’s regulation. Steve: Okay, and then you mentioned those fabrics, it was I think cotton, polyester, those are exempts, so if you have something made purely of those materials with no snaps or anything like that, generally it’s going to be compliant right off the bat, is that? Misty: For the most part, I mean there’s some more paper work to do and labeling, but as far as testing goes, it’s you are pretty much off scot free, it’s if you can make dresses without any kind of additional snap or metal part or plastic part, you are good to go, it’s even easier. Steve: I thought it would be useful to just kind of walk through an example of exactly how you would go about it, like kind of the process, so we can actually just take one of your cloth dippers, I imagine it has fabric, it has snaps and all those things. So let’s say you want to make something new, and you have these raw materials, what are kind of like the exact steps that you will go through, kind of walk us through the whole thing. Steve: That’s the fun part right? Steve: Is that all obtained locally in the United States or…? Misty: Yeah, I mean you can obtain them anywhere really, a lot of places now carry — a lot of them the major Hobby Stores will carry a line that is actually specifically for making cloth fibers and they carry the polyester PUL, the elastic, the sweat cloth– no, I think they carry winking [ph] jersey, which is also 100% polyester, elastic snaps I mean they carry it all, it’s amazing little product. Steve: So you ask them specifically for their certification as you are shopping or? Misty: Yeah, while you are shopping you just want to keep in mind, okay I need to get certification for my snaps. So if you already know that you have a company that is great, like this one company that the Hobby Stores carry it’s threads, and you can hop on their website and find by typing in your UPC code from your product on the back of your product by the barcode. If you type that into the system, it will kick back a statement saying yes this has been tested and complies, or no we have not tested this product. It’s really nice if you know going in yes these companies are already complied – they’ll already give you a statement, it’s much easier. So you go shopping, you get these– your products, your components and then you get home and you have have to– this is the boring part, the part that no one likes. You have to log all of your products — all of your components, because you want to keep track of everything. Let’s say I had a batch of the Polyester PUL and the PUL part started peeling off and delaminating and flecking, well if I never kept track I’d never be able to do a check, a quality check on that batch, and say look Hobby Store I bought this from you guys, and it’s horribly bad. So then you’re stuck with unuseful product and you waste money. So I mean there is multiple reasons for trucking this stuff, this is just boring. You going to truck it, you want to know how much it was, you want to know how much you bought, when you bought it, where you bought it, basically the 5Ws we learnt in elementary school, Who, What Where and Why and How, so you track all that. Okay we’ve got that done, we’ve tracked, time to sit down and create, so then you create your product, have [inaudible 0:24:04] get done sowing it up, and oh my gosh it looks so beautiful, I’ve taken my pictures, I’m getting ready to list it for sale, oh but wait, I need to add that label. Don’t forget to buy your labels and the labels will tell you who made it, where it was made, where the components come from, which is your made in USA of domestic or imported materials. So you got your who made it, where they made it, where the materials come from, how to get a hold of that person that made it, so maybe a website or an email, or sometimes let’s say a phone number or an actual address. Steve: I just want to thank FameBit.com for being the sponsor of the show. FameBit is the number one market place for influencer marketing with tens of thousands of YouTubers, instagramers, people on Twitter and Vine looking to promote brands from beauty, tech, gaming, pets and more. So your business can select from any or all of these channels and receive free proposals from social media influencers who can really drive you sales. And if you’ve listened to my podcast before, my one of my guys Emmanuel Eleyae used FameBit.com to make over $65,000 in sales in just four months with YouTube influencer marketing, and the best part is if you use coupon code my wifequit@famebit.com, you will automatically get $10 off. So go to FameBit.com right now, and get famous YouTubers to promote your products, now back to the show. Steve: On the label itself? Misty: And then, on the label itself, yes. Misty: And if you look at your — if you go to the store and look at the clothes you should see all the information somewhere on the, on a permanent tag, a sown in tag. And then you’ll also you have your care information, dippers, cloth dippers are considered clothing under the CPSC. So you’ll also have your cloth — your care information, that’s how do you wash it, how do you dry it, can I use bleach, can I use iron? And a lot of times on dippers you cannot use bleach or ironing, or if you do bleach it’s very little bit, and then no softeners, you will see that one quite frequently on cloth dippers. So then those are your permanent information, permanent tag informations, then you have fiber content, which can either be on the permanent tag or on a hang tag. On the fiber content as well as the care information is a regulation form the Federal Trade Commission, so you follow those regulations as well. So you’ve got your label on there, and it’s got a beautiful logo because why would you make something and not plaster it with your logo, spread your business, so you got this one there, okay it’s so beautiful, now I can take these pictures. Before you list it, make sure you have your own statement that this finished product is compliant. So we sit down and we create what is called a Children’s Product Certificate, and this certificate basically says that this type of product, this pocket cloth dipper that I just got done making, and all the other pocket cloth dippers that I make that are very similar to it, it doesn’t matter if it is red and blue or green and then yellow or stripes and poker dots, it doesn’t matter. As long as it uses the same type of fabric and the same company of snaps, you can all go on this one statement that says this product line complies under the CPSC regulation, and that’s it. Steve: Is this form just something you make for yourself, for your own records, or is it something that you [mail in]? Misty: This form stays in your records unless the CPSC is doing an investigation and they request a copy of it, and you will have to give them a hard copy of that. So I have had a couple of people ask, well can I just make it if they ask for it? Well sure, but your small batch manufacturer number that you have registered for at the very beginning needs to be on there, and it changes every year, so if they come back five years from now, because you want to keep all of this information for five years. If they come back five years from now and say I need a Children’s Product certificate for this item that you made in 2011. Can you go, okay let me get you that number and that certificate. The likelihood of you remembering everything having slept for that long is not going to be good, it’s you’re going to pull your hair even further. So get it done right away, and then you’ll also give it to any of your retailers. If you decide to go into wholesaling, to wholesale accounts for retailers, you want to give them at least a way to get a copy of it. The CPSC says that you don’t have to supply them with a hard copy, but you have to make sure that they are able to have a URL link to a copy permanently. So I like to have it on the invoice or attached to the invoice, and then also with the packing slip, so if I were to go into a retail location, they would have probably like two or three copies of it. Misty: Just like to cover myself and say I gave it to you, I promise I did. Misty: Yeah I mean it’s definitely something that is required, but you don’t have to have a hard copy, just keep it in on your computer somewhere on a flash drive. Misty: Oh my, I don’t personally have experience with toys, toys are very scary still, and Neil Cohen the small business obutsman of CPLC, he actually will laugh just like you did, because it’s not that difficult, but the problem that we have with toys is they’re ever evolving, and there’s no possible way that I could lay out it step by step like I have with clothing. Steve: What does that stand for, sorry? Steve: You know while you’re looking at it I’m going to grab a piece of my children’s clothing just to look at the tag, I’ll be right back. Hold on. Misty: Okay, it’s the American Society for Testing and Materials, and it’s actually international now, so it’s instead of changing the name it’s ASTM international. Steve: Okay, sorry I’m back. Misty: Okay, so, okay, so it’s ASTM international, American Society for Testing and Materials. They are a voluntary organization that strive to have the best safety standards for each industry, and when I say each industry I do mean each industry. It’s even larger than the CPSC is, and very often the CPSC will adopt ASTM regulations for their ASTM guidelines for the regulations. The problem that we’ve run into is the ASTM publications are copy– heavily copy-writed. I mean if they really do not like people sharing their books, and so you do need to buy a copy if you want to know the regulations. And it’s because they change every year, they update even small parts. They update information every year, usually it’s just terminology, but sometimes it is something more significant like how they test something, so that’s why it’s heavily protected. These publications run anywhere between 42 and $72. Now they are quite thick books, I have a textile one, but it is worth it. The CPSC has adopted these ASTM guidelines as a regulation for toys, so in order to find the regulations for the toys you have to purchase the standard and it’s a difficult area. Misty: And they will drop it on the ground and see if it cracks. There actually recently was a recall of wooden teethers, so I mean it is a legitimate test to be done, because we don’t want splintered wood in children’s mouths. The other thing you want to look for is small parts. Anything under three, anything– any toy for under a three year old will need to be checked for small parts. If you have the sown on button eyes, but you don’t want to worry about small parts, switch it over to the embroidered eyes and you don’t have to worry about small parts for those. Misty: I mean there’s ways around it, but I mean ultimately you look at it and go what kind of potential hazard could there be. Misty: Yeah so you can test the components all you want, but once you put them together into a toy, you have to still have it– the completed item tested because of the use and abuse part. Steve: I see, okay. Let’s go back to kind of clothing which is your expertise. Just clock diapers, and it you mentioned sleep wear as specifically you know about twenty minutes ago. Is there certain regulations specifically for sleep wear that need to be followed? Misty: Yeah, so sleep wear is– when you, if you’ve ever gone shopping for fabric on the side of the fabric you’ll see not for use in children’s sleep wear, or if you’re going through the store looking at the finished products, you see these huge yellow tags on all the pajamas and all of the pajamas look like the five T pajamas look like they can fit a twelve month old, and its because they can, I’ve done it. Misty: I’ve got a one year old and a five year old and yes my one year old can fit the five year old Jamis. They literally yell at times at something to effect of wear snag fitting not flame retardant, and it’s because it has not been treated with the flame retardant chemicals, so it has to be tight fitting and that’s to keep it from catching a flame. There’s ways around having it to be treated, and that is it tight fitting, is it for someone that’s nine months older under, is it a diaper, diapers don’t have to be treated. Then sleep socks, if it is to be used while wearing clothing, it’s considered a blanket. If you market it to be used without clothing, then you have to follow the sleep wear regulations, which means if it’s over nine months old, you have to have it treated with chemical, or have it tested to see what class of flammability it falls in, so there’s three classes. Misty: Class three is so highly flammable that it’s not allowed to be used at all. Class one and two it’s less, so you generally can use all class one materials, they don’t flame up as bad and then class two is right there in the middle, and sometimes you can use it. Steve: You gathered all this information from these manuals or? Misty: No, all of this information was actually freely available on CPSC.GOV website. Misty: As well as if you Google the CPSC information, you generally can get a hit easier on their memorandums and other archived items. You can also got to the code of federal regulations and find all of the current regulations as well as the past archived versions, and all of that information is in those codes, and they’re not easy to read. Steve: Yes they’re not, yeah. Misty: Unless you’re familiar with jargon, it’s almost like you have to have an attorney to read them for you, but not as bad as patterns, patterns are horrible. Steve: So Misty, let me just try to summarize everything you’ve talked about here, and you just tell me if I’m correct or wrong. First thing you need to do is you need to register with the SBM, was it? Misty: The, your small batch manufacturer number from the CPSC. Steve: Chances are you’re going to compliant as long as you don’t have any plastic snaps or any other knickknacks that are kind of sown on to it, right? Steve: If you do you need to contact the manufacturer of those, and get a certification that they don’t contain lead and that sort of– and valets and that sort of thing. Steve: Then the next step is to produce your product and then label it properly, and so I actually went and just grabbed one of my son’s shirts, and looks it like you have to say the country of origin, what it’s made of, and it looks like there’re these two numbers here maybe you can clarify it for me. There is this number here called RN and then there’s a number. Steve: What is that number? Misty: RN number is actually the number from the FTC. Now previously it was May 2014 they actually amended this, but before May 2014, the RN actually placed the manufacturer name as well as the location of manufacturing. What that normally is good for is the city and state that’s required by the CPSC would have been replaced by the RN number as well as not only replaces the manufacture name. Now it’s better for if I were to buy, let’s say I was to buy Hanes [ph] t-shirts and want to make them better looking, I can take the Hanes name off, leave their RN on there, because they are the manufacture of the shirt, and then add my brand to it. My own, Little Gnome Creations, and then the RN will be there to signify who the actual manufacturer is. Steve: Basically the RN you would replace with your company name and your address? Misty: Right now it is only the name. Steve: The name okay, the company name? Steve: Okay and right underneath this RN number is a CA number. Misty: That is actually the Canada equivalent to the RN number. Steve: Okay and then on the back it looks like they’re just care instructions, and that’s all I see on this shirt here, and is that everything? Misty: Is there a side seam tag? Steve: Let’s see, is there a side seam tag? I do not see a side seam tag at all. Steve: I do, I see it, okay. Steve: It looks like there is a supplier number, a style number and a PO number, and it says keep away from fire. Misty: Yes, so what those are going to be is going to be the batch number pretty much as well as the date of manufacture there. The numbers will probably colate somehow with when they finished making those products as well as a specified batch number. If you go to the store and you’d see that recall list, they have a list of numbers that are affected by the recall, that would be your batch number essentially is what you’re looking at is that number, that recall number. Steve: Okay but from the perspective of a small business you would just put in your own number there, right? Misty: Yeah you just make it up. I generally recommend creating it to where you can narrow it down as much as possible. A lot of the ladies that I’ve helped they make one of a kind items, so batch number is not regulated at all. What I have them do is say okay, put for example 810 or 815-1, signifying August 10th or August 2015, that was your first item you made in that month. Then the next item, 815-2 and that’s the second item you made that month. Five years later you can come back and go, okay I had an issue, someone complained about a safety issue with a diaper that has the batch number 815-2. I can then go to my records and say that was made August 2015, and it was the second one I made. Okay I know that I need to recall that item. Misty: It can be anything, I mean I jokingly say for your batch number you can use colors; you can use lines and shapes, or even the elvish language if you wanted. Steve: Okay, and then you mentioned the last step is to create the certificate indicating that you are in fact compliant to the best of your knowledge? Misty: I do want to say that the caviat here is, because you said to the best of my knowledge and that really is let’s focus on that to the best of your knowledge. The CPSC– I want to, I cannot trust this enough. The CPSC knows that we’re trying our hardest to comply with their regulations. They know that we’re looking at our products from the perspective of wanting to make them safe for our consumers, because their safety is important. They know that we did not know about these regulations in the past, because the education and the spreading of awareness was not there. Take that in mind when you’re starting your journey, don’t be afraid to ask them questions, they are– they generally work under a no better do better system. If something is wrong, they’ll tell you with a letter saying hey this is incorrect, and if you don’t understand why contact them and they will walk you through it, they’re very-very kind. Steve: Okay, interesting, so I know from what I’ve learnt from you today is clothing doesn’t sound that intimidating, but toys does sound quite intimidating? Misty: It’s not really, but it’s a little bit more for hoops to jump through. Steve: Well certainly you need to pay more money right? Because you absolutely have to get it tested for sure right? Steve: Whereas it sounds like for clothing you can kind of just get by you know with other people’s certificates and not getting anything tested? Steve: Okay, well Misty that was actually very helpful and I’m sure there’s a lot of listeners out there who want to create their own children’s clothing and don’t know where to go, and so I know that you have this awesome Facebook group which I will link to in the show notes, but are there any other resources? Before we talked you mentioned you have this publication coming out that kind outlines out this. Where can people find you and find more about this publication? Misty: Yes, so I’ve got, as you mentioned before, the real diaper industry association, RDIA, we have worked very hard to compile all this information and make it look pretty, and it’s not just for compliance, it has other issues that businesses should be aware of and will help be– help each business be A sustainable business. That’s all we’re geared towards is we want you to be sustainable. We focus on clock diapers, but the information for clock diapers is the same for all clothing, so this publication is going to be useful for everyone that is interested in children’s clothing. And we’re slated to put it out in October as our sneak pick at our annual conference in Las Vegas, and after that it should be out for sale hopefully shortly after that. We’ll– it’s kind of deep right now, I’ll let you know Steve as it is we get that information pinned down, but yeah I’m really excited for it. Misty: Yeah absolutely, if, — you can give my email in the notes as well. You can contact me by email, by Facebook, you can contact me through my store Little Gnome Creations, and it’s Little Gnome G-N-O-M-E Creations at hyena curt. Misty: I believe you can get there through just littlegnomecreations.com, but I’m not positive on that, I’ll have to get back to you on that. Definitely I’ve got the one on one compliance without a headache, it’s one on one two hours, absolutely no distractions, just you and me talking it out, getting all of your questions answered, and just making sure you are confident in your business. We want you to run the business, not the business to run you. Steve: Okay, that sounds great Misty, and thanks a lot for coming on the show, and I will put up all these links in the show notes and maybe some of the examples of certificates or something if you can send those my way, I’ll post those as examples as well. Steve: Thanks a lot Misty have a good day. Steve: Hope you enjoyed that episode. I actually get hundreds of emails every week from people who want to sell children’s products and clothing, and many of them are actually selling them illegally online. You’ve got to remember that anytime a child touches a product, it has to be certified and Misty is an expert in this area. For more information about this episode go to my wifequitherjob.com/episode91, and if you enjoyed this episode please go to iTunes and leave me a review. This is by far the best way to support the show, and please tell your friends because the greatest compliment that you can give me is to write a referral to someone else either in person or to share it on the web. Now if you’re interested in starting your own online business, be sure to sign up for my free six day mini-course where I show you how my wife and I managed to make over 100k in profit in our first year of business. Go to mywifequitherjob.com, there’s a form right there on the front page, sign up and I’ll send you the course right away. Now I also want to thank HostGator for sponsoring this episode. HostGater is one of the best webhosts out there that I recommend if you want to start a blog, and in fact I hosted my wifequiteherjob.com on there in the very beginning and I loved it. You get 24/7 live support via chat, phone and email, and you can install WordPress in just a single click. The best part is that I’m offering a 30% discount for all podcast listeners. Go to hostgator.com/mywifequit to redeem the discount, and once again that’s hostgator.com/mywifequit. I also want to thank bigcommerce for sponsoring this episode. Bigcommerce is one of the best shopping carts that I recommend if you want to start you own online store without having to worry about anything technical. Everything from design, to sourcing, to payment processing, is all built in, so all you’ve got to do is populate it with products that you want to sell and you can literally start your store in a matter of hours. Simply go to bigcommerce.com/mywifequitherjob, sign up and you’ll instantly receive one month free. Once again the URL is bigcommerce.com/mywifequitherjob. Thanks for listening. Thanks for listening to the mywifequitherjob podcast, where we are giving the courage people need to start their own online business. For more information visit Steve’s blog at www.mywifequiteherjob.com.